Like they did for the Iraq War, the corporate media has grossly under-represented this week’s U.S. peace protests against Israel’s assault on Gaza. A Dec. 31st Associated Press story on the protests reported that “hundreds” of people had participated in “pro-Palestinian protests” on Tues., Dec. 30th, and made it seem as if these protests had only occurred in five cities: N.Y.C, L.A., Tampa and Fort Lauderdale, and Dearborn, Michigan. Here is a list of cities the AP managed to leave out of its coverage. 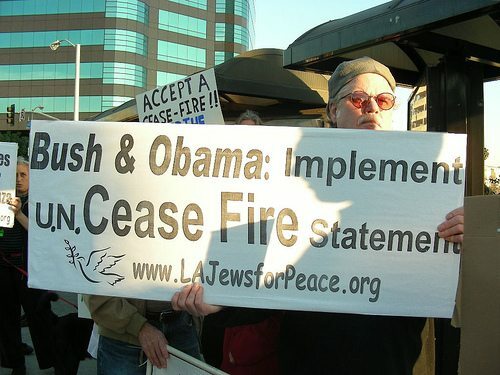 According to ANSWER and the U.S. Campaign to End the Israeli Occupation, they all announced specific protests or vigils for Dec. 30th: Chicago, Cincinnati, Philadelphia, Baltimore, Boston, Atlanta, Sioux Falls, SD, Knoxville, TN, Norfolk, VA, Louisville, KY, Cedar Rapids, IA, Portland, OR, Dallas, Houston, Albuquerque, Phoenix, Tucson, Seattle, Ann Arbor, St. Paul-Minneapolis, Denver, Colorado Springs, as well as Flint and Kalamazoo, MI, Concord and Portsmouth, NH, Burlington and Montpelier, VT, Youngston, OH, Ocala, FL, and New Brunswick, NJ. In California, the AP ignored San Francisco, Sacramento, San Diego, San Jose, Sonoma, Modesto, San Mateo, Santa Rosa. In New York, they overlooked Buffalo, Rochester, Syracuse, Albany, and Ithaca. In Washington, they forgot Seattle, Tacoma, Olympia, and Bellingham. And even Anchorage, Alaska, Honolulu, Hawaii, and Kailua, where President-elect Obama is vacationing, demonstrated their dissent. (The small protest outside Obama’s compound was noted here and here. And protests were also called on other days this week, despite the distraction of the holidays, in at least 19 American cities. The most diligent seem to be St. Louis, MO, and Houston, TX which have called protests daily so far since Dec. 28th. 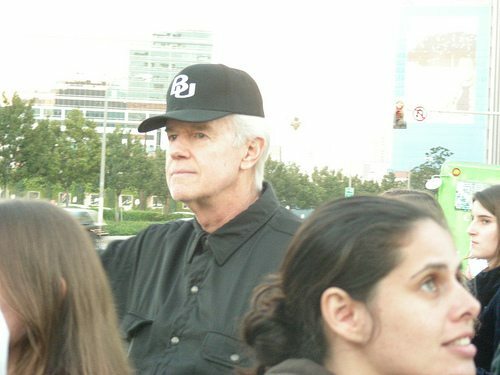 See Protesters in Westwood (Los Angeles) Dec. 30th photos. Warner insisted: “The siege has to end. If that ends, the rockets will stop, and the parties can talk.” The group also wants Obama “to withdraw American military forces from the Middle East” since the presence of the U.S. there is “a barrier to peace.” The group calls on Obama to “make clear that as President he will quickly assert US leadership to achieve a comprehensive diplomatic resolution of the Israeli-Palestinian and Arab-Israeli conflicts.” While L.A. Jews for Peace condemns the Hamas rockets and “deplores all loss of life and human suffering on both sides,” they believe Israel’s “massive response represents a huge escalation of the conflict that may lead to a wider war.” Moreover, “the cycle of violence, which is spiraling out of control, runs counter to Israeli and Palestinian security” and “breeds anti-American terrorism.” See Mike Farrell in L.A. Jews for Peace protest vigil photos. Jodie Evans, co-founder of the very serious but also very playful women’s peace group CODEPINK (http://www.codepink4peace.org/), was likewise “disgusted that Obama didn’t make a statement. He’s had an opinion about everything else. This is an atrocity and if he doesn’t call it an atrocity, it’s shameful.” He should “use his place of leadership to clarify things.” Evans said that CODEPINK is “outraged” by the assault on Gaza, which is the “result of the violation of human rights for far too long”, and will be delivering a petition to Secretary of State Condoleeza Rice next week. A few miles across town, a very animated protest initiated by ANSWER (Act Now to Stop War and End Racism) and Palestinian and Arab organizations was also in full-swing Tues. evening on the sidewalk outside the Israeli Consulate of L.A. There were so many people, it was extremely difficult to push through the crowd, and very hard to converse with all the chanting and drumming. 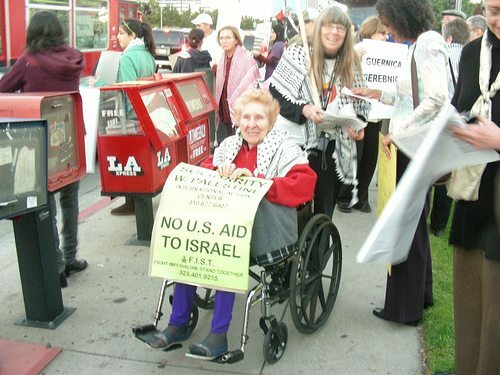 Muna Coobtee, long-time ANSWER-LA activist, said that the ANSWER Coalition demands “an end to the bombardment and the blockade of Gaza”. Coobtee called the air strikes on Gaza “a massacre” and “completely outrageous”. She was also very critical of the U.S.’ role in the assault, saying that it’s “clear” that Israel has “U.S. approval” or it would not proceed. She called the U.S. “entirely complicit” and urged Obama “to come out strongly against this.” The ANSWER Coalition is also one of a number of organizations calling for an end to US aid to Israel. During the demonstration, one of the protesters against the air strikes on Gaza was arrested. An eye-witness reported that police had pushed his wife backwards by pushing on her chest, so the man responded by shoving the police officer back and was handcuffed and led across the street. The crowd was unified, however, and persisted in chanting “Let him go.” As a result, the man was released. Kurtzman was handing out flyers for the group’s upcoming screening of the Alex Jones’ documentary “Terrorstorm: A History of Government Sponsored Terrorism”, a film which lists Nazi Germany, Italy, Britain, and the U.S. among governments which have mounted false flag operations (acts of terror attributed to another entity for political purposes). One of the movie’s claims is that Israel’s sustained bombardment of the U.S.S. Liberty during the Six-Day War of 1967 was no accident, but the result of a deal between President Lyndon Johnson and Israel – an attempted false flag operation intended to cast blame on Egypt and thereby justify the U.S. joining the war in the Middle East. Different sides of the U.S.S. Liberty controversy are presented here. Like for the anti-Iraq war movement, it’s important for folks to know of how widespread opposition against the Israeli incursion is, in this country. Israel left for peace. Let me see isolating a whole people. NO food, inefficient medical supplies, stealing the water supply, cutting there electricity and keeping them in an open air jailed. The people still living under a brutal occupation. HOW did Israel leave? Zionism is a great evil machine. Israel is 4th largest army in the world and there fighting with a bunch of gang members in the meanwhile killing innocent children and women. Gaza has the most condense population there is no where to hide. You can drive all of Gaza in three hours.